Being Frugal and Making It Work: Oriental Trading is the Go-To Stop for Summer Fun! Oriental Trading is the Go-To Stop for Summer Fun! Summer is about sunshine and smiles. As a kid I always liked school, but I always looked forward to summer because it was always so much fun! As a parent, I want my children to enjoy summer as much as possible. That's why summer is about fun activities and making memories! 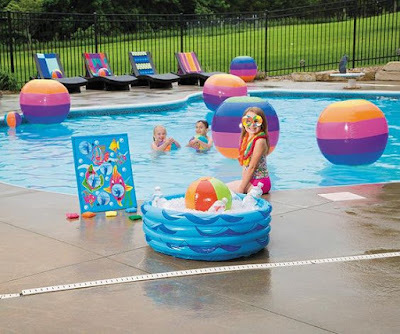 Summer fun includes camping, sleepovers, road trips, boating, swimming, baseball games and so much more... and Oriental Trading has all of your summertime fun essentials all in one place for a price that you will love! When I think of summer, the first thing that comes to mind (other than sunshine) is water! There are so many fun summer activities that require water. 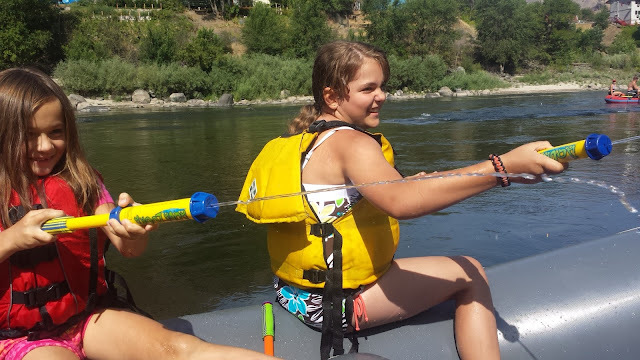 Swimming, boating, water fights and water parks! Water fun in the summer also means; water guns, water squirters, inflatable floaties, beach balls, and goggles! You will find all of these great summer fun toys and games at Oriental Trading and then some. Every single time I browse through their website or catalog, I find something new! I always have a difficult time making my choices because there are so many great items to choose from. Summer also means camping and sleep-overs. 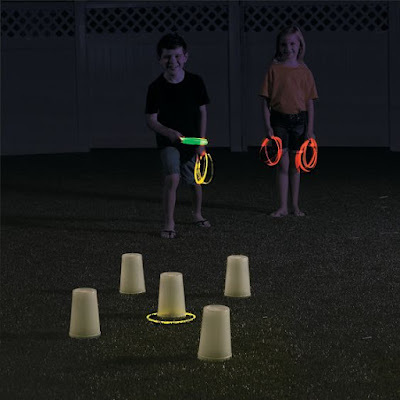 No camping trip or sleepover would ever be complete without campfires, S'mores, glow sticks and games like flashlight tag and kick-the-can! As you can probably imagine, Oriental Trading also has an amazing selection of fun glow products that are perfect for hot summer nights! A few of my personal favorites are the glow-in-the-dark sunglasses, flying disks, and beach balls. These would be perfect for any sleepover or beach party! Would summer be complete without hosting or attending a luau? I think not! Summer just wouldn't be the same without a fun, tropical luau party with family and friends! 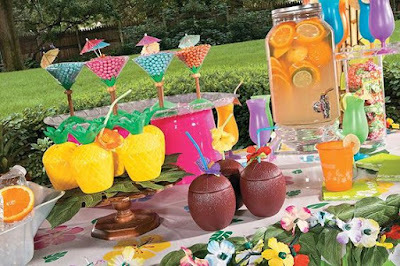 Planning a luau party is a breeze with Oriental Trading's huge selection of tropical party supplies. You will find party favors, Hawaiian leis, grass skirts, party games, tropical drinkware, centerpieces, decorations and much more! Fast shipping, convenient, and affordable... it doesn't get much better than that! I'm also a huge fan of their clearance and less than perfect items! In fact, Oriental Trading Company is the nation's largest direct merchant of value-priced party supplies, arts and crafts, toys and novelties, and a leading provider of school supplies and affordable home décor and giftware. Party favors, decorations, tableware, crafts, candy, novelties, games... the selections are endless! Not only do I love the fun, affordable selections for every holiday and occasion - I love how quickly my items arrive each and every single time I place an order. If you aren't already a happy Oriental Trading customer (or even if you are), be sure to request a free catalog and start making your party list! There are currently 8 amazing catalogs to choose from; Party, Crafts, Beading, Wedding, Birthday, Teaching and Supplies, Fun and Faith, and Spring. Order one or order them all! I get the catalog from them. Anyway, our fave summer activity is going fishing around our place. I also get their catalog, they have some great party products. I have never shopped at Oriental Trading before. I have heard of them though. I didn't realize all the great products they carried.